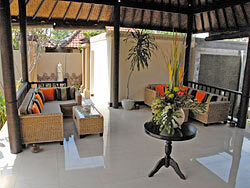 Bali Spa The spa is located in Jimbaran (near Mac Donald) about 10 minutes drive from Ngurah Rai International Airport. 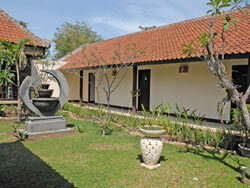 Kunthi Bali Spa has calm atmosphere because it is built at the back of the by-pass. The spa offers long-time treatment packages as reasonable price and the villa package which you can spend leisurely time in the private villa. Hair theraphy combines natural coconut milk with aloe bera and lemon will suits your brain, stimulate hair growth and relax your entire body. Our natural scrub used to lift the dead outerskin and dirt without negative effect, the mixed tropical fruits and honeybee are the natural nutrition for your skin. Start with head, shoulder, hand and body massage, continued with one of the indian's treatment technic to make a balancing of body's protection, movement and metabolism. Foot pressure is systematically aplied to stimulate the nerves in the feet. These points correspond to all major body part and organs to improving total body function, restoring, balance and harmony. A light, calming massage with a choise of specifically formulated essential blend of Bali flowers, exotic fruits and spice island will help to relax the muscles and shooting effect of your emotions. Traditional relaxing massage used for centuries, begin with a relaxing massage and followed by Balinese warm spices body masker will help to increase your blood circulation. The perfect treatment for tired and aching muscles, this warm compress will promote blood circulation release aches and pains. The warmed stones with natural power ease the tension and cure swelling and cold, and improve blood circulation. The massage with warmed medical hearb oil, removes toxin from inside of the body, and herbal ball or warme stone massage warms up the body and removes body waste. Shirodhara called "Brain Massage" is also appried to relax nerves and mind. 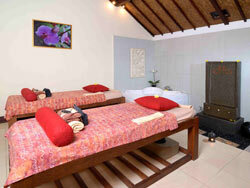 This detox massage using Bokashi oil that traditional Balinese general medicine. This oil effective for tight muscle and stress and gives you refreshment feel. It is recommend for guest who having fatigue. Relax nerve by Peppermint Foot Wash, improve blood circulation and remove stiffness and tiredness by the Kunthi Bali original Natural Aroma Massage. Moisturized whole body by Original Scrub & Mask, refresh in Flower Bath, and then, apply Cream Bath or Facial. Relax nerve by Peppermint Foot Wash, improve blood circulation and remove stiffness and tiredness by the Kunthi Bali original Natural Aroma Massage. 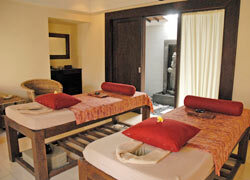 Lead body and mind to the deep relaxation by the power of Stone Massage, and remove horny substance by Original Scrub. Relax nerve by Peppermint Foot Wash, improve blood circulation and remove stiffness and tiredness by the Kunthi Bali original Natural Aroma Massage. Apply Warm Stone or Herbal Ball to warm and massage body in order to sweat and remove toxin and body wastes, and lead you to deep relaxation. 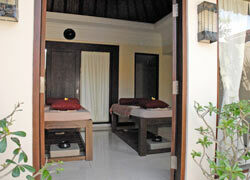 For finishing, apply Shirodara and Cream Bath; it has great healing effect, the recommended menu in Kunthi Bali. 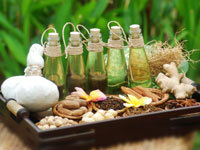 This package has the main treatiemt afrom Ayurveda. It removes stress and relaxes you by pouring Sirodhara oil on the center of the forehead called "Third Eye". The total care leads you into the great relaxation. Free transportation service is available by booking package with over 2 people. Children can wait in the lobby or the treatment room during parent's treatment. There are menus for children over age age 12. ・All the menus include welcome drink and cold towel. ・Expecting pregnacy cannot take the treatment except Facial and Cream Bath. I took spa treatment at this spa on the last day of my holiday in Bali. I had much time before the flight time comes and I got relaxed at spa. It`s good that the staffs can communicate in Japanese. I should have villa package…. The product of body mask is full of extracts that are good for the skin. It contains fruit and honey. Its extracts nourish the skin and make the skin soft. 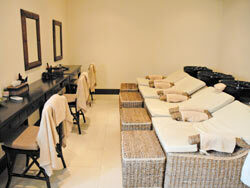 Spa rooms are clean, and the service of spa owned by Japanese was also very good.